This pattern has been redesigned and it now comes with a video tutorialJust keep scrolling down this page if you want the original 2012 pattern. This original Giraffe pattern is now retired. You can still use this pattern but keep in mind retired patterns do not receive any pattern support. This pattern has been well used and so far nobody has mentioned it was difficult or had any mistakes it's just all my Little Bigfoot designs are getting updated. Text and images contained inside this pattern are not authorized to be sold as a cross stitch pattern nor shared in full or in part on any cross stitch site nor on any DIY site nor on any website. This does not exclude sites or members of sites posting copyrighted material under the guise of educational purposes. Text and images contained within this pattern are not authorized to be traded, given, received or sold for points, gold coins or for any other form of monetary value. Special notes: I worked in continuous rounds with a 3.75mm hook and worsted weight yarn. Have any questions or if you come across a mistake in the pattern please leave a message in the comment section below. *Remember if you use safety eyes to put them in before stuffing and closing up the head. * stuff head while pushing the stuffing into the sides of the head as you stuff. 6) sl st into next st then f/o leave long tail for sewing. how you make these and how many are optional. I made 2 with yarn but you could also use pieces of brown felt. that's awesome Toni-Nicole!! So glad to read your messages and it's fun to know your son will be getting this collection of Little Bigfoot characters, I just love that!! 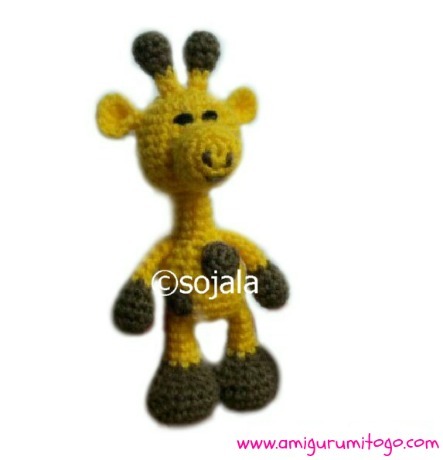 Thank you very much for this very, very cute giraffe amigurumi. My granddaughter will just love him. Thank you Aimee :) So glad!! how cute is this one iv saved pattern and wrote this one out to do straight away printer is out of action at moment. Hi Sharon! I'm about to begin making this collection for my son.. I'm so excited because he is going to love them! They are some of his favorite animals! I wanted to ask you before I start if you happen to have a penguin, and if you don't, would you mind if I sort of adapt one of your patterns to be a penguin.. Giraffe, elephant, turtle and penguin are my little guys favorites! Thank you for sharing this collection! You've done a wonderful job with them! No, I don't mind at all, in fact I really like the idea of a penguin. I might have to make one too, lol I never thought of one before but I think that would be super cute! This pattern is so awesome!! Thank you...I made it in a few hours and made my 9 year old giraffe lover very very happy!!! awww, thanks so much! 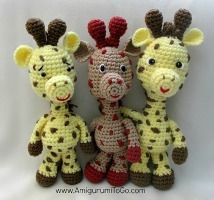 I'm glad you liked the pattern and so happy to hear your 9 yr old has a new giraffe friend! I like these bigfoots! I made them too. I made a giraf and i made a zebra, thanks for putting the pattern on your site! What is the finished size in length of this cutie? Hello! Love all your little bigfoot patterns. What size safety eyes did you use? Thank you.. for this Giraffe it's yarn. For the others I used 7.5 mm but 8 mm would work fine. Thank you so much for replying so quickly! Just started on the cute giraffe. Looking forward to following your blog for more wonderfully cute fantastic patterns! Btw - I have pinned you on my Pinterest board as well. Thanks for the big foot patterns, I love them all. I made the lion and the giraffe. thank you ,see you and your channel you tube ! Hello Ruth! I changed the copyright because I don't want people to feel like they have to link to me or mention me if they make something to sell. I used to think that was the way to go but now I just want people to be free to mention or not to mention the designer, either way is fine. I put the pattern is not to be sold because I still find my free patterns from time to time being sold online which isn't fair to the buyer. And no I don't mind at all if you sell finished products, that makes me happy. And yes, feel free to adapt the patterns into anything you'd like! A squirrel sounds so cute! Thanks so much for asking, I do appreciate it. Good luck in your sales and Happy Crocheting!! yes, I will do that. I can't say when but I'll do it. Subscribe to my youtube channel and you'll get notifications when I upload new videos. Thanks for asking! Cute cute cute! I finaly make one for myself! This cute giraf! I usualy give away all the amigurumi I make. But this one is for the bag I crochete! Thank you thank you for sharing! Thanks for the pattern! :) It's so cute! wow!! Those are so gorgeous! I love the colors you chose too ~ Happy Crocheting! !